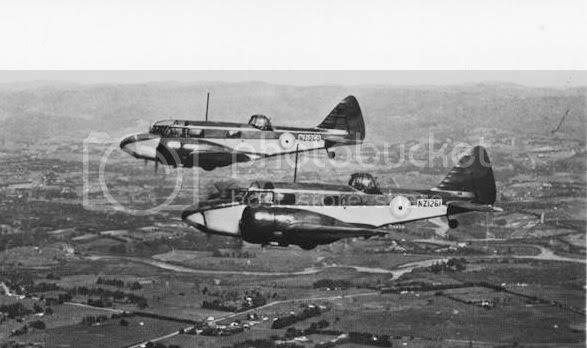 After the very interesting photos that have come up on the successful Harvard Pile thread I think it's time to start another thread on the Harvard's twin-engined cousin, the Airspeed Oxford. 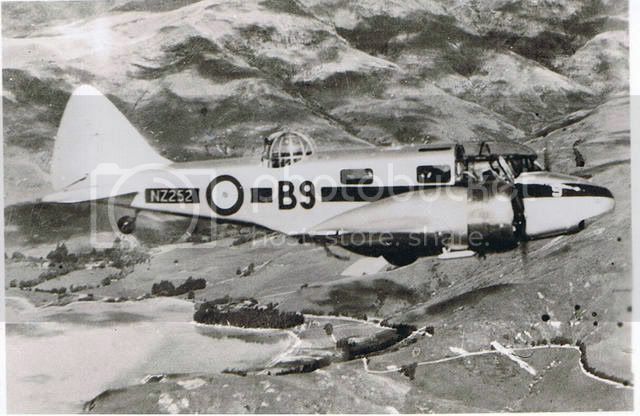 I think the Oxford is one of the most under-rated aircraft in RNZAF history, you hear so little about it yet after the Corsair it was our most numerous type. It was used to train pilots in multi-engine flying, navigators, air gunners, wireless operators, bomb aimers and probably more roles. It was used on operational squadrons as a transport, a hack and also as a multi-engine trainer. They wore a load of different colour schemes and I'm sure there must be a stack of interesting photos out there. I'll kick the thread off with a couple. 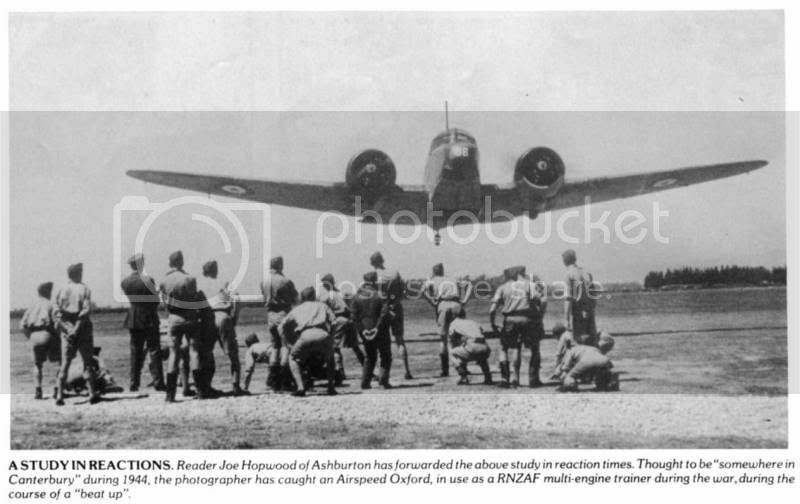 This first one is one of my favourite photos, and is scanned from NZ Wings. Love it! These two come from the late Ron Findlay's collection, via his daughter Adrienne Jackson, kindly scanned for me by Don Simms. 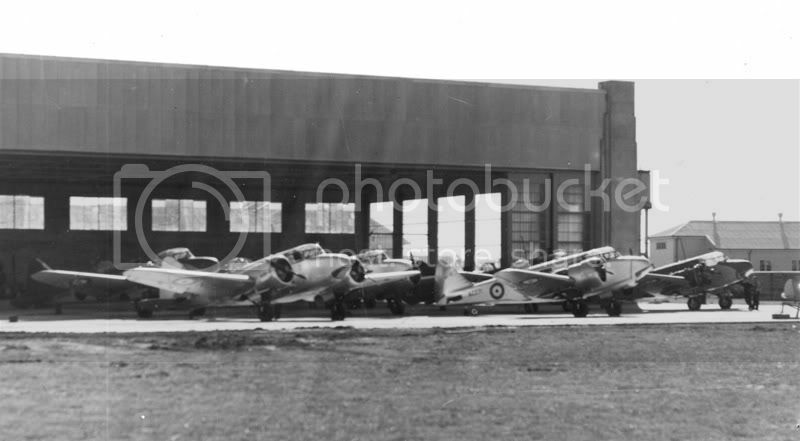 They show the prewar Oxfords at home in their Wigram hangar in 1938. Some more Oxfords for the pile. Superb, thanks. The first three I'd seen before but the two photos of the poor old crashed Oxbox is new to me. 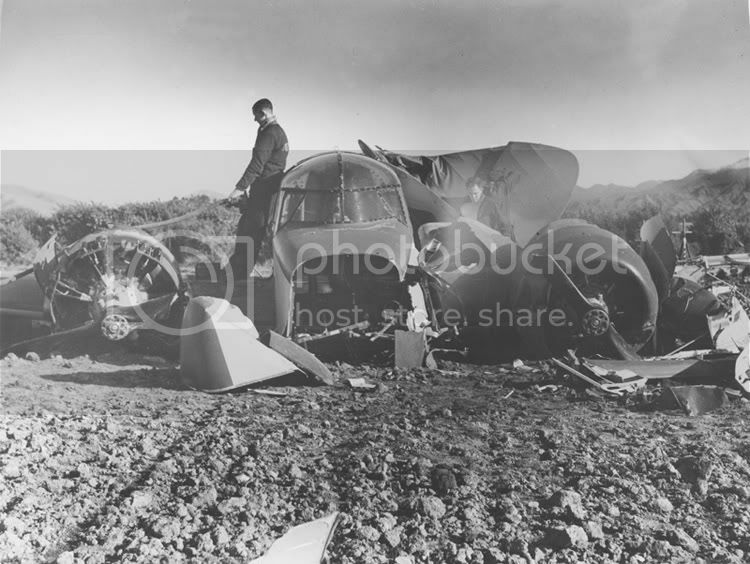 Have you any further details on this Oxford and the crash at all please? 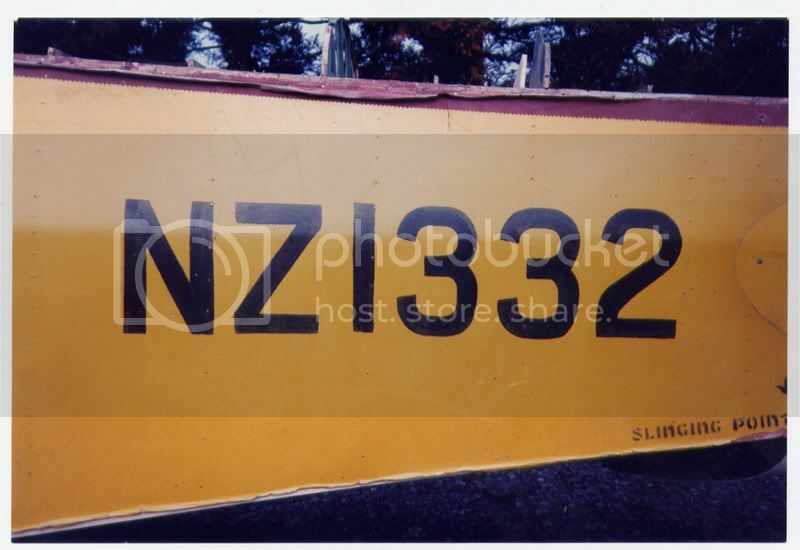 Interesting that NZ251 wears the code B7 in my photo and B11 in your photo. Very nice, are there any under restoration in NZ. I have a feeling that MoTaT have one??? There are two Oxfords under active restoration. One is at Wigram with the Air Force Museum, and is a Canadian Oxford which is on long term loan (read probably permanent) to the museum. It was an Oxford that was converted to a Consul and is now being converted back to Oxford - and is quite advanced. The other is with the Subritzky collection and is probably the most remarkable Oxford left in the world. It is almost totally original. It was bought after the war by someone in Wanganui who was a Communist and he dismantled it so he could send photos to his Russian overlords to show he was active in dismantling New Zealand's military, and win brownie points form the Soviets. That was told to me by the guy who found it. 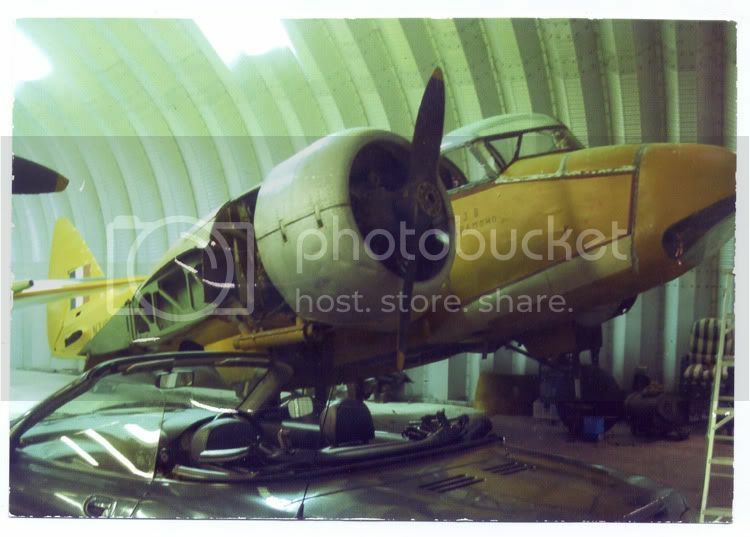 It wears its original wartime paint and is near mint. Almost every part is present and they intend to eventually restore it back to pristine static condition which is great. meanwhile the same team have been building a replica as they go, based on paterns from the genuine one, and Mike Subritzky told me they plan to fly it. I really hope they succeed with that, it will be marvellous to see one back in the air. There's also an ex-Singapore Airlines Oxford stored at Mandeville, and I know of another project to restore an ex-RNZAF one based on a collection of metal bits that requires all new wood, but as the owner works for Glyn Powell it doesn't seem quite so unlikely as those guys work wonderful wooden miracles. SUPERB! That's news to me, and what amazing news it is! Wow! A flying Oxbox again, fantastic! The great news just keeps on coming! For what its worth, here's my shots of an Oxford nose display at Warbirds Over Wanaka 08, the closest I've yet been to one of my all time favourite aircraft. Dave, if you can, please oh please keep me posted on the replica. And if anyone (ahem, Ryan.....?) has pics/info of the Mandeville machine I'd love to see them. 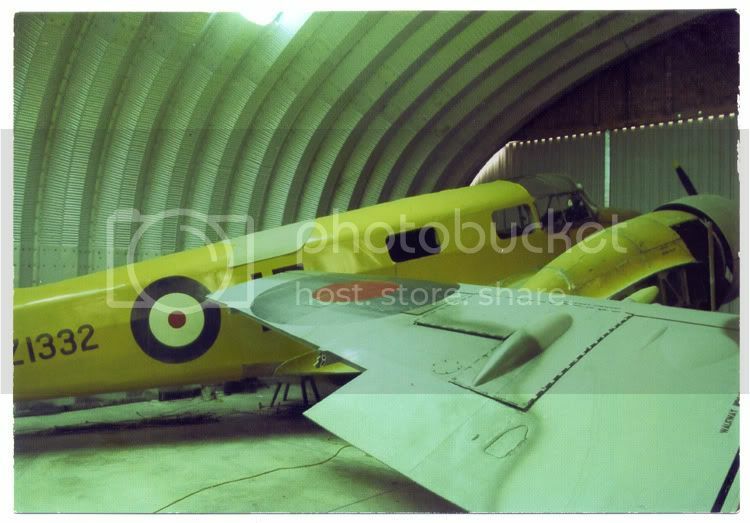 It was about May 2005 when I saw the replica Oxford fuselage at the Subritzky's farm. It was not well advanced, and I've heard nothing more on either of their projects' advancement except for Bill Billings said to me and Dennis Gibbons at Omaka in 2007 that they were concentrating ont he Oxford restoration at that time and had stopped work on the Vincent at that time. That's all I've heard. I'm keen to hear how these things are going too. Maybe Shamus knows more? That nose was built by John Skene from CAA and was done from the original drawings and parts. He has also done one powerplant for it. 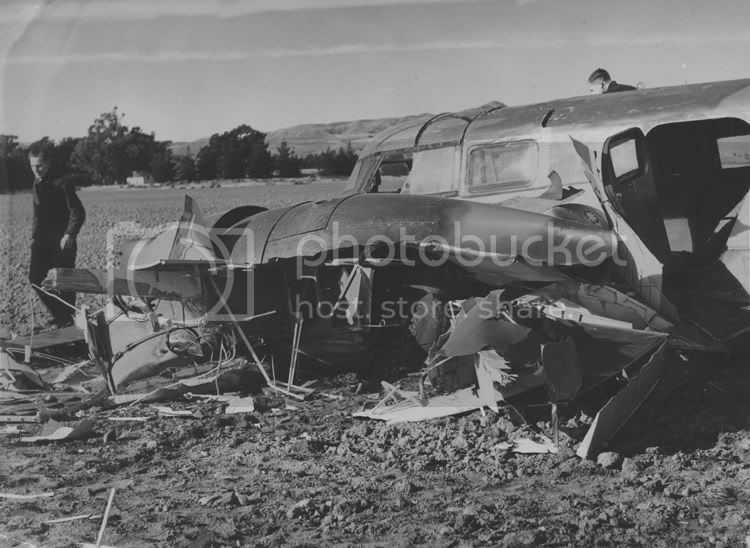 The Oxford was a chunky looking aircraft but going by the crash pictures a sturdy one as the cockpit looks fairly intact. be nice to see one completed and one in the air would be just perfect. I saw a lot of Oxford parts while I was at the Air Force Museum, even tidied up a pair of rudder pedals as a wee side project for myself. I know the museum had a set of wings but no fuse to speak of but all the metal bits including u/cart, engines etc. Of course with the Consul/Oxford from Canada they may not need it all. maybe they could pass it on if they get to keep the Oxford. Love the low pass and the reactions are quite varied, check out the guy trying to dig himself a trench!!
" 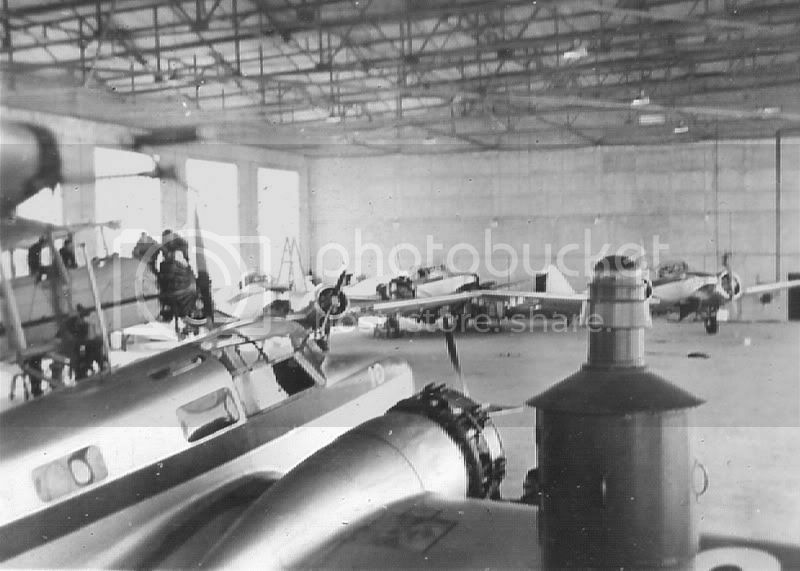 I think the Oxford is one of the most under-rated aircraft in RNZAF history, you hear so little about it yet after the Corsair it was our most numerous type." Yes, I was just seeing who would be the first to spot that deliberate error. Well done Grant. 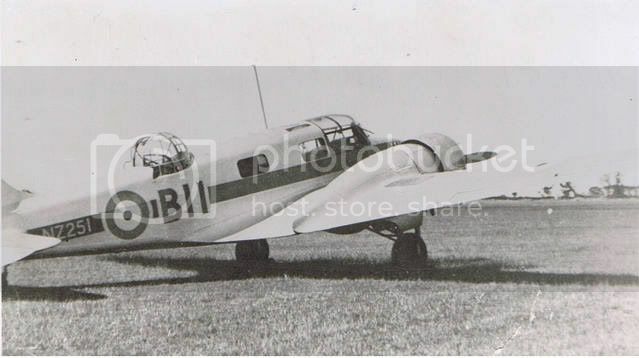 Actually, I was going by memory and should have checked that, i was confusing its figure with the Tiger Moth total, another trainer. Considering 229 served in the RNZAF and only one almost complete survivor exists, it's a bit sad. Especially considering how many were sold to private individuals after the war. It's a shame none were preserved by collectors at the time. It amazes me they didn't stay active in civil hands like the Tiger Moths did, they'd have made good aeroclub machines I'd think. Maybe they were costly to run? Or was it the glue having the same issues as the Mossies? Baz, I wouldn't really call the Oxford chunky, it's quite sleak and streamlines considering other British types of its day. I think Neville Shute designed a very nice looking machine. 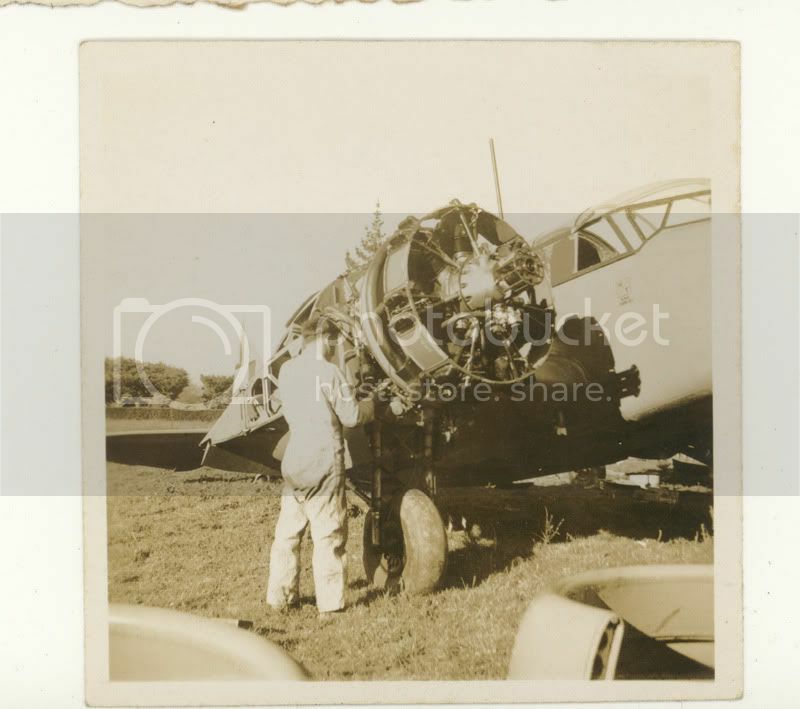 I dont really know , but Id think one radial engine , let alone two , would have put the cost of running an Oxford beyond most aeroclubs ability in the day ( and after they had sat too long , the woodwork is then another issue ) . When I was a bit younger , I recall watching the Monospar displayed at Omaka ( before being destroyed by fire ) , I still recall how impressive it was , and kind of imagine an Oxford would be like that -- on steriods . One day maybe ? Having seen the return to the skies of aircraft that only existed in Museums(if you were lucky) and the skill of many worldwide (and not least here in good old NZ) I think it wouldn't be totally impossible to see an Oxford fly one day. 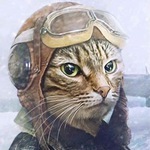 One in RNZAF markings would be a bonus! Dave. While I was in Wanganui I did the original inspection for Don, and reported back to him on the Oxford. My recollection at the time was the fuselage was complete and the wing centre section also. Don't think their were any engines. Will take some photos when I am next at Dairy Flat in a week or two. I know Don is working on the Oxford now but I believe Steve is still working on the Vincent. Meanwhile here is a photo of its serial. wow its like a time machine, the paint looks like it was applied yesterday. Thanks Shamus. It's remarkable how good the paintwork is. No sign of service wear or degrading over time. A true treasure that Oxford. Good to hear both the Subritzky Oxford and Vincent are progressing. 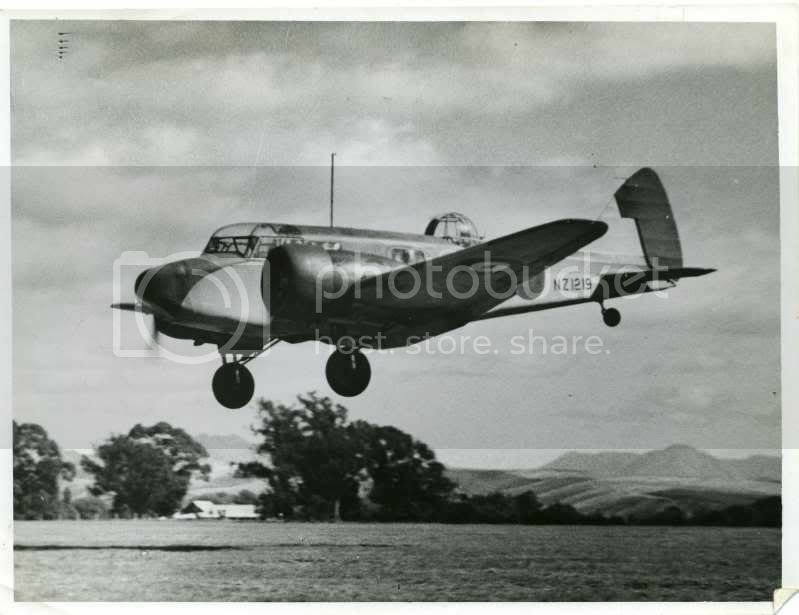 I found these two photos of the Oxford at Dairy Flat. I must have taken them when I did the previous one and forgotten them. 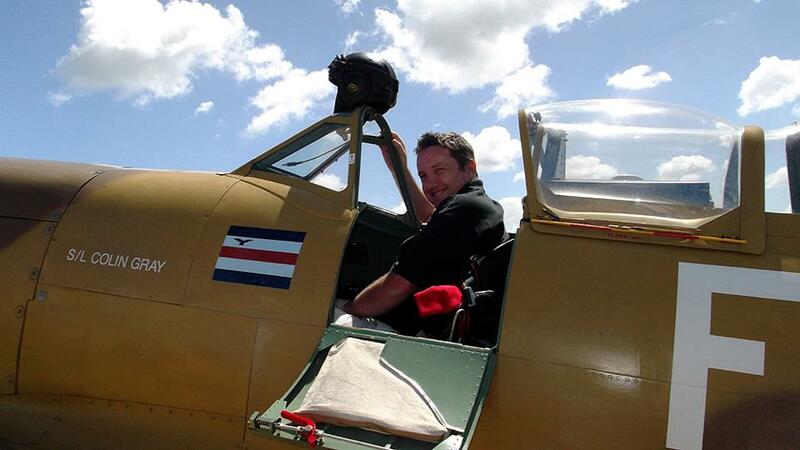 As you can see by the wing, the Spitfire was there at the time. Some more for the Oxford pile. 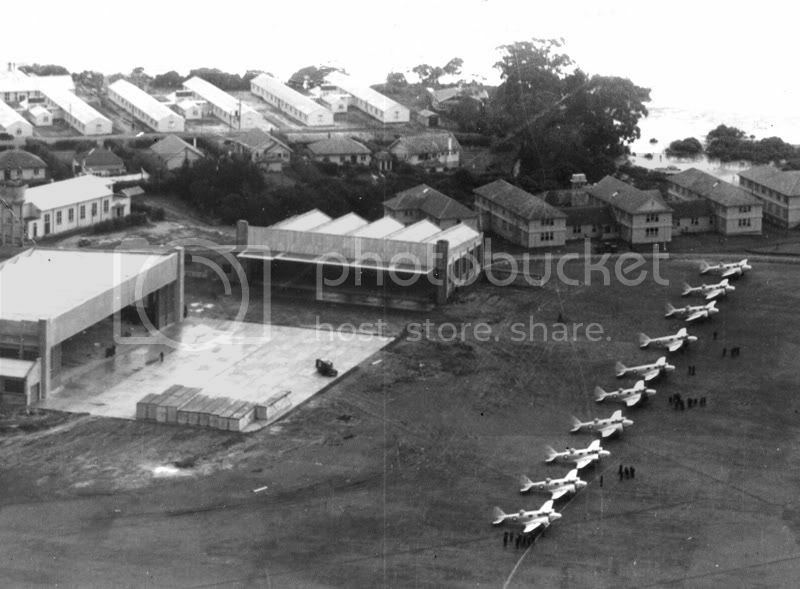 Aerial shot of 10 Oxfords, Hobsonville (RNZAF Photo). Oxfords at Hobsonville. 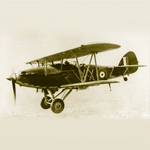 (RNZAF Photo). An engineer working on an Oxford engine. That last batch of photos is excellent. I especially love the aeril shot of Hobsonville. The last shot looks somewhat rural. Not only are the cowls and prop off but also the wing. 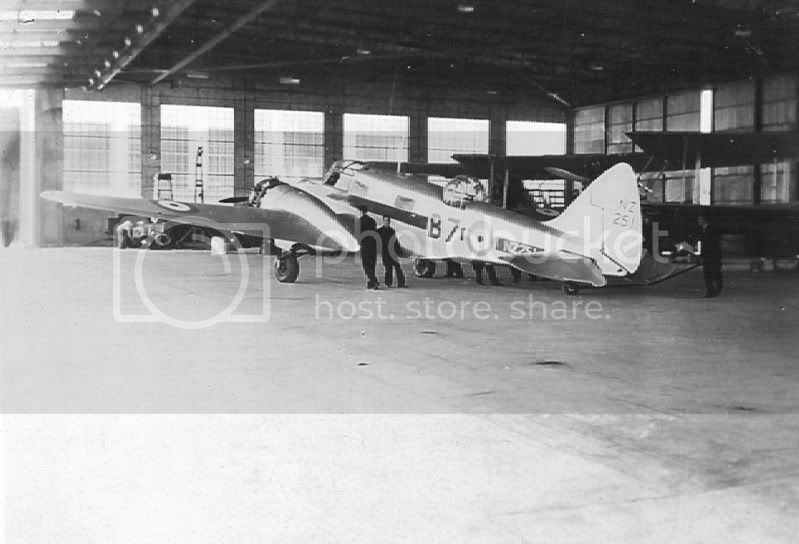 I wonder if this was during assembly at Hobsonville or disassembly after the war?